Egrets and other birds building nests near ponds that harbor crocodiles or alligators should be suspicious of sticks they see floating in the water. That twig or branch may be bait for a trap set by the reptiles, as new research suggests they may have joined the few species that use tools to lure prey. According to Valdimir Dinets, a zoologist known for his studies of crocodilian (crocodiles and alligators) behavior, two species of the large reptiles have been observed using twigs and sticks as bird lures. 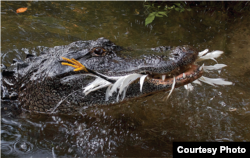 But, he says, the birds have to “pay” for the protection because their chicks can sometimes fall into the water where they are usually devoured by crocodilians. Observing alligators at two egret nesting sites for a year, Dinets saw stick displaying mostly during the bird’s breeding season, between March and June and more frequently during nest building, from late March and April. Dinets says it’s “unknown” what factors lead to the stick-displaying behavior at particular locations and at certain times of the year. “These discoveries are interesting not just because they show how easy it is to underestimate the intelligence of even relatively familiar animals, but also because crocodilians are a sister taxon of dinosaurs and flying reptiles,” he concludes.